Social media automation and the use of bots is a subject that is discussed a lot- but also very little. Well, there are many different types of social media automation, but in this article, we’re going to focus on bot automation on social media, used to grow your presence and followers. Now the reason why the term automation and bot are used to describe the same thing is that when you automate something on social media, you’re putting bots to do the job your automating. It’s important that social media bots, in this context is not confused with automation like messaging bots, because these are actually quite good and helpful, and they’re being used by tons of brands every day. Don’t get me wrong. I am all for using bots on social media that helps make your life easier, while also providing better and faster service to your audience. But what separates the bad ones from the evil is very simple: are they allowed on the platform they are used on or are they not? These are so-called “good bots” that are created to make the social media platform better, created officially by the creator of the platform. But long-term – and short-term, they can hurt you rather than help you, and that is exactly the reason I created this article. I’ve tried using bots – so you don’t have to. Let’s dig in. What about social media bots? Social media bots is a hot topic, and more and more people (and brands) are turning to automation tools to boost their followings and their presence. Bots can be found for all the major platforms like Instagram, Facebook, Twitter, and Pinterest, and the use of bots is a widespread problem that the platforms are battling with every day. Before I start bringing up the reasons you shouldn’t use them, let’s look at what the automation bots that I am talking about really are. Of course, not all bots are equal, so what they do will and how they will do things differs from case to case, but they have a few things in common. The reason why these services are up and available to use – and easy to access is that it’s not illegal to create them. The social platforms that they are created for don’t have a lot of power against them, and getting them down is quite the challenge. The bots work in several different ways. 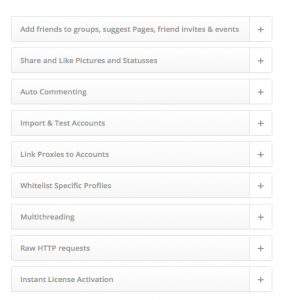 They can like posts on your behalf, follow users, comment on posts, and even send private messages. Surprisingly (or unsurprisingly) these automation bots are actually quite clever. They can be set to target particular conversations, keywords, and hashtags, to ensure that you are actually reaching relevant people. A problem that the less developed automation services struggle with. Now, some of these actions are actually innocent, but it is the ones that include spamming that isn’t allowed. On the surface, social media automation almost seems too good to be true. You save time and money while generating better results. What is it not to love? Unfortunately, everything that seems too good to be true most often is. 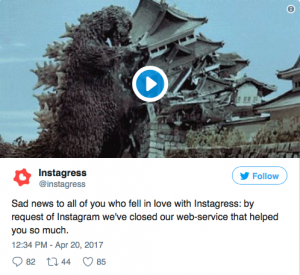 As an experiment, I’ve tried using a bot on Instagram, and I’ve faced many of the pitfalls that come with using an automation service. The social media spam-bots that I am talking about in this article have one thing in common. They are not allowed. Now, as I said earlier, it is not illegal to create these services, and this is the reason to why it’s so difficult for the social platforms that are harmed by them to put an end to it. What is prohibited is to connect them with your account, as a user of that platform. The only weapon the social platforms have is to buy the services and then put them to sleep for good. In fact, that is exactly what Instagram has done, several times. 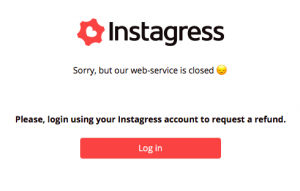 In fact, on April the 20th, 2017, one of the largest Instagram automation services Instagress was closed and shut down forever. According to them, it was due to a “request” of Instagram, but the real truth is that there was cash involved. 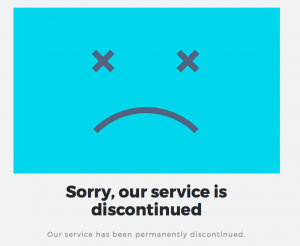 The next day, the other biggest Instagram automation service Massplanner was also shut down. All the major social media platforms are working day and night to battle the bots that are harming the user experience for the real users on their respective platform. Think about it: who wants to interact with a bot? I know I don’t. Maybe if you are looking for clear and concise answers like “when do you open?”, but these are not questions that the bots answer to. More on that on the next point. And all the major social platforms have similar rules, so this does not only go for Instagram. The bottom line is that if the social platform you are using bots on finds out that you do, they will permanently ban your account, thus killing everything you’ve worked for. And chances are, even if you’re using an automated service, you’ve probably put quite some time into your account. As the social platforms get better and better at detecting spam-like behavior, the odds of getting caught is greater than ever. So if you plan on using bots, ask yourself: Am I okay with my account being permanently banned? For a brand, the answer is probably no. The main actions that people who use bots are using, are comments, likes, and follows. Most of the services will allow you to specify hashtags that you want to find content to “spam” on, thus allowing you to reach more relevant people, as mentioned earlier, and then, the bot will automatically comment, like or follow people based on the hashtags you select. Most bots can do all at the same time. It’s all about how you select your settings. A big problem is when you’re using the bot to leave comments.The services allow you to pre-write comments for it, that it then picks from when interacting with people from the hashtags you select. The services allow you to pre-write comments for it, that it then picks from when interacting with people from the hashtags you select. So far so good. “This sounds awesome, where do I sign up?”. Don’t clap just yet. The big issue and the awkward moments come when the bot starts leaving the comments all across the posts that it finds on your specified hashtag. First off, for the comments to work, you have to write very generic comments, because, in reality, you will have zero clues in what it is the bot will comment on. 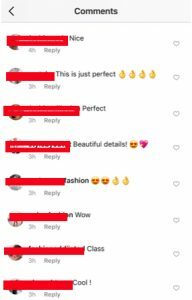 And as you can imagine, generic comments is an extremely easy and quick way for people to see that you are using a bot and that it wasn’t really you that left the comment, thus minimising and decreasing the impact and tenuity that your comment had the possibility to hold. These generic comments can be anything from emojis to phrases like “nice” and “awesome”. Every single one of them is so generic that it gets awkward. When you leave comments, and have no idea on what type of post, or whose post you’re leaving it on, you’re at high risk. What if you would make the mistake of commenting “Awesome, love it” on someone that posts a photo from a funeral? As someone that is looking to grow their account personally, mistakes like these can be awkward but not much more. For a brand to commit that mistake, it can be devastating. As a brand, you simply cannot afford to put your brand at such a risk, even though social media automation has a few benefits. Even if your comments won’t be that awkward and inappropriate most of the time, there are tons of other scenarios that can be awkward and weird for your brand or account. There is simply too much room for awkward mistakes and inappropriate comments with the use of a bot that you have very little control over (once it gets going), and this risk is simply too great to be able to motivate the use of the bot. People will end up wondering why a random account is commenting on their pictures and why you are leaving such weird comments. There’s nothing wrong with commenting on people’s posts on social media, but if you are going to do so, you need to adapt your comment to the post you are commenting on, and this is something that bots cannot do. The single main reason why social media marketing is effective for businesses is that it allows you to cultivate genuine relationships with your audience, start conversations, engage your potential clients and build trust. The only problem is that a bot hardly does any of that. It only sniffs on them a bit and then leaves them hanging. I’ve already talked quite a bit about how the generic bot comments can have devastating results, and the big problem with this is that you cannot achieve any of the things listed above with the help of generic comments. Will you ever get to know a person well if you only talk about them very thoroughly about the weather, celebrities, world events etc.? No! You need to include personality, which means personal thoughts, ideas, and things that make you, you. This is the only way that you can build real, deep, valuable relationships that lets people build trust in you, and ultimately feel obligated to buy from you. What this means is that yes, you might be able to start a conversation with people, but these conversations will be so shallow that they won’t help with conversions. If you’re lucky, they might just start following you, but then what? Followers mean nothing if they aren’t engaged, and automation won’t help you with making them that. When something seems too good to be true, it usually is and automation is no exception. Yes, the bot will be able to comment on a ton of posts in a short period of time – something you can only dream about doing yourself, considering how time-consuming is. But the only problem is that the quality of the people/relations you attract and build is so low that it isn’t even something to be proud of. By spending extra time on your customer interactions, you will be able to provide quality responses that actually foster real, genuine relationships allowing you to turn your followers into clients. When you are using the bot and choose to use it to follow other users, you can wave goodbye to your feed. The bot will follow a ton of people in a short period of time (often several thousand), which means that you will get completely irrelevant posts in your feed that you couldn’t care less about. You will see low-quality images and a ton of other extremely weird stuff that you wish you didn’t see. Trust me, when I created my experiment account, I saw it all. And it wasn’t a pleasant sight. To prevent this article from being one-sided, I thought it was a good idea bringing in another perspective of this matter. Before you start commenting about all the benefits of using “sketchy and un-allowed” bot-services on social media, I am fully aware of them. Everything has both benefits and downsides, and it would be wrong of me to only mention the downsides of using social automation. While the downsides are far more than the upsides, upsides do exist with using bots. After all, if they didn’t, people wouldn’t use them! First off, by using social media automation, you are saving a lot of time. Social media is extremely time-consuming, and for a busy marketer, using a bot can help remove a lot of weight on your shoulders. I’ve mentioned how bad comments can be, and what awkward situations they create, but I didn’t mention likes. Likes are actually quite innocent, yet lets you get your account discovered by relevant people without the risk of ending up in awkward situations. While likes aren’t as effective to building relationships and getting followers, they will do more good than they do harm – as long as you don’t get caught and have your account banned. Based on the information presented in this article, are you for or against the use of social media automation and bots? You already know my opinion, but what about yours?